A new mini PC in the form of the RockPro64 is expected to be made available in a few months time, with a launch pencilled in for March 15th, 2018 and pricing expected to be placed between $59 and $65. The small mini PC will be sporting a Rockchip RK3399 processor, offering a 6-core chip equipped with two ARM Cortex-A72 CPU cores, four Cortex-A53 cores and ARM Mali-T864 graphics. 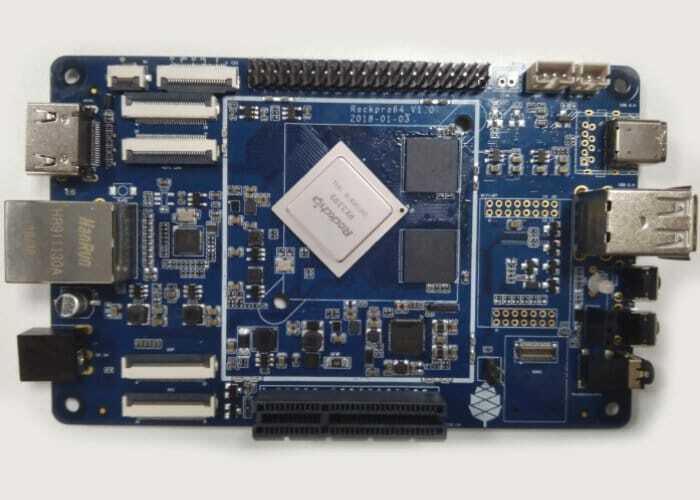 With a slightly larger but similar form factor to the awesome Raspberry Pi, the RockPro64 measures 5.2 x 3.1 x 0.74 inches in size and providing more processing power. Similar to the Raspberry Pi the RockPro64 is equipped with a I/O ports and GPIO pins and has been designed primarily as a development board. However, as with the Raspberry Pi, it can also be used as a small desktop computer, thanks to its support for both Android and Linux operating systems. The entry-level RockPro64 mini PC comes equipped with 2GB of RAM, a microSD card reader the storage for $60. If you are looking for a little more performance then the 4GB of RAM system might be worth more investigation and is expected to sell for around $79, and will also be arriving in March 2018. For more processing power the even faster Rockpro64-AI system will be launching during August 2018 priced at $99. Ports on the RockPro64 mini PC include Gigabit Ethernet, USB 3.0 Type-C and Type-A ports, 2 x USB 2.0 ports, 40-pin GPIO header, 1 x PCIe 4x slot, and 1 x HDMI 2.0. Unfortunately, connectivity via Bluetooth and wireless connections are not built-in however an SDIO socket is provided for connecting a wireless module if desired. As more information is announced for the RockPro64 nearer its launch date as well as confirmed to release dates and pricing, we will keep you up-to-date as always.